We all want a good night’s sleep, and most of us are willing to try just about anything to sleep through the night. Sleep is incredibly important for your health and well-being, reduces your risk of heart disease and diabetes, and keeps your immune system healthy. To experience the benefits of sleep, it’s recommended that you get 7 to 9 hours of sleep per night, and with our busy lives and difficulty falling asleep at night, getting enough sleep can be a real challenge. 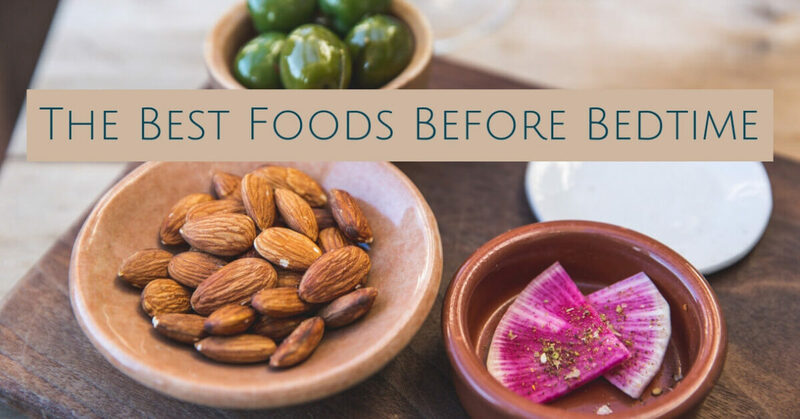 Along with being physically active during the day and avoiding blue light in the evening, there are a few foods that can help you sleep better. Looking for a bedtime snack? Skip the sweets and grab a handful of almonds or walnuts. These nuts are full of nutrients such as magnesium, riboflavin, phosphorus, manganese, copper, and antioxidants, as well as containing a lot of healthy fats such as omega-3 fatty acids. They’ll actually help you sleep, because these tree nuts also contain melatonin, the hormone that regulates sleep. Increasing melatonin in your body will help you fall asleep faster and sleep more deeply. The magnesium in almonds and walnuts could also help you sleep by reducing cortisol levels in your body. Cortisol, known as the stress hormone, inhibits sleep and keeps you awake. Kiwi fruit are packed full of fiber, nutrients, minerals, and vitamins, and one kiwi includes more than 100% of the daily recommended intake of vitamin C. Not only that, but kiwis have been shown to reduce inflammation, promote digestion, and lower your cholesterol levels. One recent study followed 24 adults who ate two kiwis every day, one hour before going to bed. At the end of four weeks, the adults fell asleep on average 42% sooner than before, and their total amount of sleep each night increased by 13%. White rice is considered a staple food in many countries, and it’s grown all around the world. While many say that in the refining process white rice loses a lot of its nutrients and antioxidants, it still contains vitamins and minerals such as manganese, thiamin, and folate. It’s also full of carbs, and can quickly affect your blood sugar levels, and it’s been shown that eating a moderate among of rice a few hours before bed could help you sleep better. If your mother ever recommended chamomile tea before bed, she had a good reason to suggest this classic night-time tea. Chamomile tea is a herbal tea with a lot of health benefits. It’s most known for its flavones, a type of antioxidant that reduce inflammation and can decrease your chances of cancer and heart disease. This tea has also been shown to protect your immune system, reduce anxiety, promote calm, and even improve your skin health. When it comes to sleeping, chamomile tea contains apigenin, an antioxidant that promotes drowsiness and helps you fall asleep faster. Studies have found that those who drink chamomile tea before bed experience better sleep when compared to those who don’t drink tea. Another great food to help you sleep is fish. Skip the steak, and choose a fatty fish like trout, tuna, or salmon instead. These fish contain high levels of vitamin D and are loaded with healthy omega-3 fatty acids like EPA and DHA that boost brain health and reduce your chances of heart disease. These fatty acids increase the hormone serotonin, and serotonin helps you relax and feel drowsy at night. Drinking milk before bed could also promote sleep and help you wake up feeling refreshed. Milk contains tryptophan, an amino acid that affects serotonin. When more serotonin is released in the brain, you’ll feel more comfortable and drowsy, and will fall asleep easier. If you’re tried everything to get a good night’s sleep, but nothing seems to be working, visit us at Sound Sleep Medical. We’ll help you form good sleep habits, like getting active during the day, avoiding blue light at night, and eating foods that promote sleep. Our specialists will also help you determine if you suffer from sleep apnea or any other sleep disorders, and work with you to find the treatment options that will have you sleeping deeply through the night.